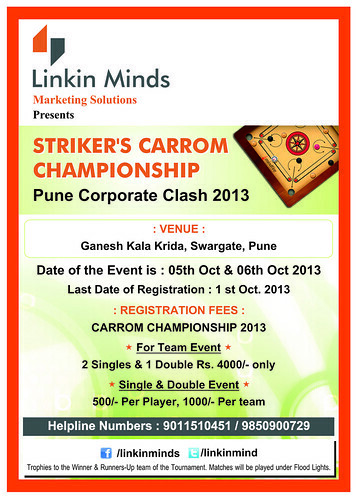 Linkinmind presents STRIKERS CARROM CHAMPIONSHIP - Pune - Corporate Clash 13 on 5t & 6th Oct.
1. Deadline to submit this form is 01st Oct 2013. 2. All decisions of the referees are final during the event. 3. The Participants/Team must strictly follow the time limit and other rules/regulations or Participants/team will be disqualified. 4. All participants must be registered for the convention. 5. Respectful, courteous and polite behavior is expected and required from every participant and their companions (parents, siblings or anyone else that accompanies the participant). Any foul language, taunts or other insulting and provoking behavior will result in expulsion and disqualification of the participant from that event and all other events. (Group and single). 6. It is the responsibility of the participant to be present before the event begins. No one shall be allowed to take part in the competition if they are not present at the location by the given time. In case of a conflict between multiple events at the same time, participant should inform the coordinators in advance, so they can work it out. 8. Any disputes related to competition i.e. Participant’s Age, Qualification or decision of a referee, needs to be turned into your coordinator. It is the responsibility of your coordinator to hand that to the Sports Convener or its committee members in writing within 6 hours of the announcement of the winners or incidence. No verbal complaints will be considered. A decision will be taken within 6 hours of filing the complaint. The decision of the Sports Committee will be final. 9. The sports committee will have the full authority to change or cancel any event with approval from steering committee. You are invited to attend Linkinmind presents STRIKERS CARROM CHAMPIONSHIP - Pune - Corporate Clash 13 on 5t & 6th Oct.